Founded by Greg Wurm in 1987, Peninsula Piano Brokers buys, sells, trades, rents and tunes pianos of all kinds. 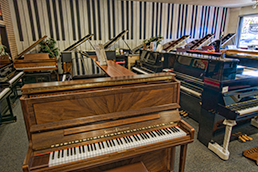 Our inventory ranges from 75 to 85 pianos at any given time. Currently, 28 of these are grand pianos. With a real musician's knowledge of all of the instruments in his store, Greg has helped thousands of people find the right piano for them (whether acoustic or digital, domestic or imported). He has sold nearly every brand of piano and is considered one of the most knowledgeable piano men in the country. © 2011 Peninsula Piano Brokers. All Rights Reserved.